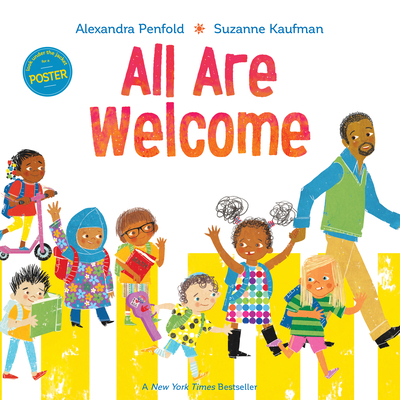 A warm, welcoming picture book that celebrates diversity and gives encouragement and support to all kids. Follow a group of children through a day in their school, where everyone is welcomed with open arms. A school where kids in patkas, hijabs, and yarmulkes play side-by-side with friends in baseball caps. A school where students grow and learn from each other's traditions and the whole community gathers to celebrate the Lunar New Year. All Are Welcome lets young children know that no matter what, they have a place, they have a space, they are welcome in their school. “This is a must-read for pre-school and elementary classrooms everywhere. An important book that celebrates diversity and inclusion in a beautiful, age-appropriate way.” – Trudy Ludwig, author of The Invisible Boy and Quiet Please, Owen McPhee! Alexandra Penfold is the author of Eat, Sleep, Poop (Knopf, 2016) and the forthcoming picture books The Littlest Viking (Knopf) and Everybody's Going to the Food Truck Fest (FSG). She is also a literary agent at Upstart Crow, where one of her clients is Suzanne Kaufman! Learn more about Alex on Twitter at @agentpenfold. Suzanne Kaufman is an author, illustrator, and animator. Over the years she's done everything from animating special effects for Universal Television and the Discovery Channel to animating award-winning video games for children. She's the illustrator of a number of books for children including Samanthasaurus Rex by B. B. Mandell, the forthcoming Naughty Claudine by Patrick Jennings, 100 Bugs by Kate Narita and her own book, Confiscated! among others. Learn more about Suzanne online at suzannekaufman.com or on Twitter at @lilmonkeydraws.